But at the weekend it was my MILs birthday and I wanted to make something special for her first bday as a Nana. I've seen the posh boxes of cakes and always though 'I could do that' so now was the time to try. Spent Saturday quizzing hubbie on what she would like (part of the reason I decided to embark on the project was that he always says she likes cakes like him and cupcakes would be a great present but now he was saying she didn't like buttercream! Dug to the bottom of this, buttercream would be okay if didn't taste of butter(?) 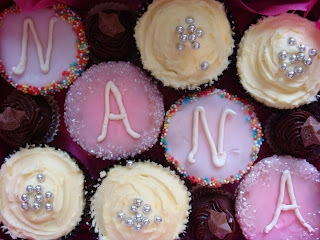 Worked round this by deciding on lemon flavour cupcakes, mini chocolate ganache cupcakes and iced fairy cakes with the all important 'Nana' lettering. Once munchkin was tucked up the baking began. And it went so well at first. The lemon cakes came out the oven perfectly risen, hubbie was happy eating the chocolate cake mix. Then I realised I did not have enough caster sugar for the last batch so hubbie was packed off to Asda. Our very own cupcake decided she was missing out on something so I brought her in to help me make the ganache desperately trying not to get her covered! When daddy came back he had to spend quite a while getting her back to sleep while I cracked on. And crack I did, the pyrex dish I'd mixed the ganache in. Pretty much just threw it onto the kitchen floor and would never had believed how many millions of pieces it could shatter into! They did look very pretty and taste rather yummy even if I do say so myself! As for whether my mum will be getting any for her birthday next week, well, maybe if she wasn't called 'Grandma' she'd be in with a better chance.